My firstborn just started middle school, and our relationship has officially entered new territory. She’s growing into her own opinions, preferences, and personality. No longer am I just the teacher and authority over her life; I now get the privilege of walking alongside her, coaching and encouraging as she discovers on her own who God made her to be. What a wonderful opportunity we parents have been given to help our tweens in that process. Here are five ways to make an impact on your daughter’s heart and spiritual growth as she heads into the teen years. Ask for help—Tweens love feeling useful and valued. Ask your daughter to help you find a recipe for dinner or a pair of earrings to complement your outfit. Giving her tasks throughout the day that aren’t just chores but rather require her input will help give her a sense of purpose in the family. Write hidden notes—Write encouraging notes to your daughter on post-its and hide them in her books, clothing drawers, art supplies and other places she’s bound to find them throughout the week. Challenge her to see how many she can find in a week or a month. Respect her interests—Ask questions about your daughter’s favorite songs, apps, YouTube shows and so on. Show an interest in the things that interest her. Be careful not to criticize them carelessly, but rather respect her developing tastes and preferences. This will encourage her to think for herself—a necessary skill in becoming a responsible adult. 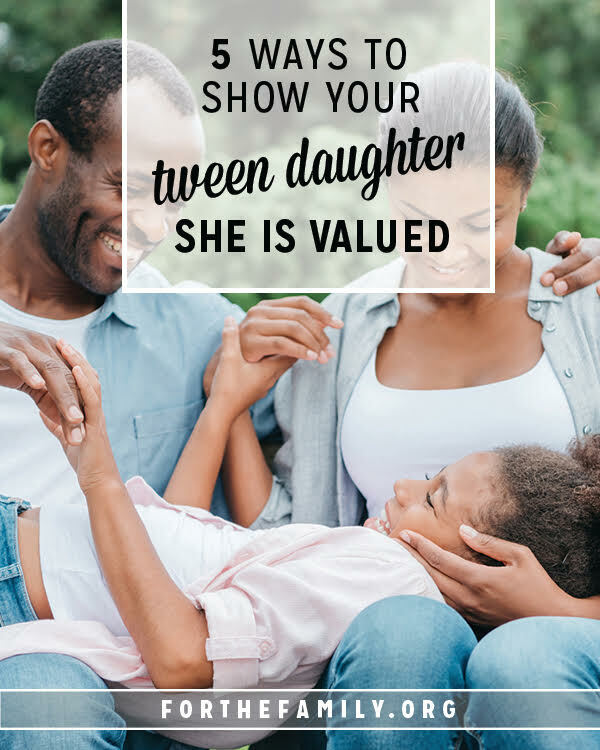 Invest time in her—During the tween years, it becomes especially important to be emotionally available to our daughters. They are facing increasing pressures at school and in social circles. Make sure she knows you are a safe and welcoming place to land. Set aside time to talk when she wants to talk. Take her out for frappes, bike rides, thrift shopping—whatever she enjoys. Building a relationship and a rapport is critical to maintaining a positive influence in our children’s lives as they head toward the teen years and beyond. Share God with her—Pray with and for your daughter. Let her hear you thank God for the gift of having her in your life. Read the Bible with her. Do a devotion together that’s specifically aimed at building faith in a tween girl’s heart. I recommend the FaithGirlz Bible and Wynter Pitts’ devotionals for tweens, You’re God’s Girl, For Girls Like You, and God’s Girl Says Yes. Whatever you choose, enjoy the bonds that come with exploring God’s Word together. “A cord of three strands is not quickly broken” (Ecclesiastes 4:12).